I have a Honda eu2000i that is very easy on gas consumption but im wondering if it makes sense to convert gasoline into power to run my propane whole house furnace or if it is more economical to use that same propane in a stand alone propane convection tower (on a long hose) to heat the house. I hope my question makes sense. 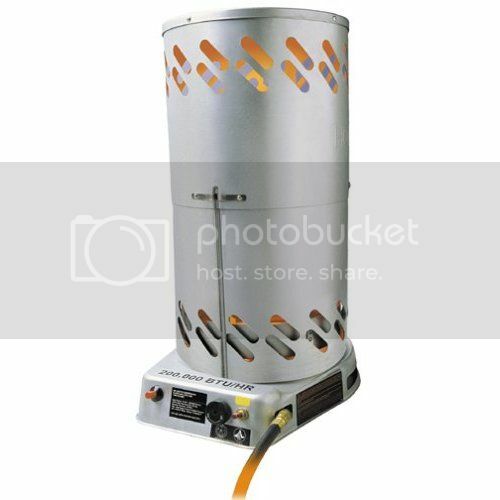 Basicly is the tower heater the most effficient way to extract the BTUs from the propane? Why turn my limited gasoline into power and then use that power to heat my home? Those heaters are not rated for home use. If you are going propane buy a Mr Heater big buddy. Garage heaters need to remain in the garage. If everyone is replaceable, then stop being everyone. Do you need to heat your ENTIRE house in case of an emergency? Would 1 or two rooms get you through? Well, small propane heaters (I prefer kero, but to each his own) are extremely efficient, so you would extend your propane reserves using 1 or 2 small propane heaters to keep a couple rooms warm vs heating your entire house. Plus, you don't have the sound of a generator running. I also like redundancy: Completely separate heating system in case the primary fails. Then there are people who run their generators 24/7 during a power outage so what can you do? There are ventless and vented propane heaters you can wall mount but you need to make sure they cover everything you need to heat. I had an 80ft single wide with a wall mounted ventless heater about 20ft from one end. I had to run it wide open to keep the bathroom on the other end of the mobile home from freezing. Temps near the heater were great but the bathroom probably was in the mid 40s or so. Enough to keep it from freezing but if I had a wife and kids I would have wanted a solid way to circulate the heat and make things more liveable. And as already mentioned make sure you are looking at indoor rated stuff. I personally could see wiring up the furnace to run off the generator since you could run the furnace for a bit to warm the house up and then shut everything down. I am not a fan of running a genny all the time. I would also go ahead and be working on finding some of the buddy heaters or a wall mount setup and get the propane heater once it is on closeout as spring comes closer. Me being me, if I only did one thing I would go with an indoor rated propane setup to have 2 seperate systems as already mentioned. Please do not engage in personal attacks, even if they are correct. The real issue is CO. you can't run any unvented heater in a small area without ventalation and a co dectector. If it gets really cold you'll be tempted to cut down on the draft of fresh air. had tied it into the hard line with rubber gas hose. I often would let in some fresh air and shut down the unit till I left.